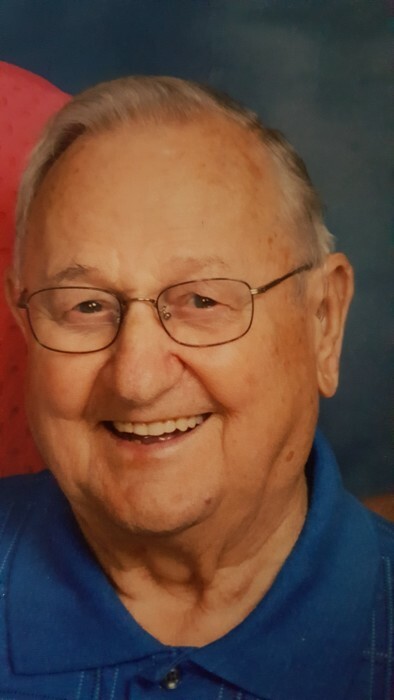 Obituary for Roland "Slip" Campbell Jr. | Kostanski Funeral Home, Inc.
Roland "Slip" Campbell Jr., 90, passed away peacefully on Friday 3/29/19 at Baystate Medical Center in Springfield surrounded by his loving family. He was born 4/15/28 to Roland and Mabel (Bourbeau) Campbell of Turners Falls. He was raised and educated in Turners Falls and graduated high school in 1946. He went on to take classes at Greenfield Community College. He was employed by the Montague Rod & Reel and worked as a carpenter in the local union where he worked in several local projects including the Vernon and Rowe atomic plants. He was then employed by Greenfield Community College for 18 years earning a state Carbella award. He served on numerous committees and retired in 1994. He was drafted into the Army and served in Korea and Japan as a member of the 223rd regiment - 40th division. He was discharged in 1952 attaining the rank of Sergeant 1st class. He was awarded the Combat Infantry Badge. In January 1953 he married Adella Markol and they were happily married for 66 years. They had 4 children. He enjoyed all sports, especially rooting for the Yankees. He also enjoyed golfing. He was a former member of the Franklin County Barbershop Chorus. He especially enjoyed singing and was a member of the Lady of Our Peace Church choir. Besides his wife he leaves behind 4 children, Russell (Alayne), Cathryn (Steve), Michael (Lori), and Susan (John); 5 grandchildren Michael (Kara), Kalyn (Anders), Saryn, Emily and Megan; 2 step grandchildren Christopher and David; 1 great grandchild Fay. Services will be Friday 4/5/19 at 9:15 am at Kostanski Funeral Home 1 Kostanski Square followed by a Liturgy of Christian Burial at 10 am at Our Lady of Peace Church with the Rev. Stanley Aksamit pastor officiating. Burial will follow in St. Mary's Cemetery. Calling hours will be held Thursday 4/4/19 from 5-7 pm at the funeral home. In lieu of flowers memorial donations may be made to Our Lady of Peace Church Renovation Fund, 90 7th St. ,Turners Falls, MA 01376.